Abstract: Pyomyositis is typically thought of as a disease of the tropics. However, it is becoming more prevalent in temperate regions, and may be underdiagnosed. 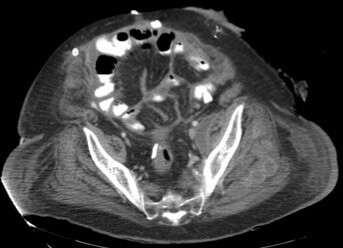 Here, pyomyositis is encountered as a complication of perforated diverticulitis, which has not been previously reported. A 61-year-old Caucasian man initially presented in respiratory distress and was diagnosed with respiratory failure due to COPD exacerbation. The patient was taking high-dose prednisone, 60 mg daily for the past 2 years. Initially, he was afebrile, normotensive, tachycardic to 178 beats/minute and tachypneic to 28 breaths/minute, requiring noninvasive ventilation to maintain oxygenation. Blood tests revealed leukocytosis of 16.7×103/μL, and blood cultures grew Escherichia coli. Broad-spectrum antibiotics were started but leukocytosis and bacteremia persisted on repeated tests. On the seventh hospital day, a CT scan of the abdomen was performed for complaints of abdominal pain, and the patient was diagnosed with Hinchey stage 3 diverticulitis. A Hartmann’s procedure was performed with intraoperative findings of purulent peritonitis. Intraoperative cultures grew E. coli and vancomycin-resistant Enterococcus faecium. The patient continued to have leukocytosis of 15.1×103/μL despite surgical therapy. He began to complain of left lower extremity pain, and a CT scan on hospital day 24 revealed gluteal intramuscular abscesses, which were percutaneously drained. Persistent symptoms prompted another CT scan on hospital day 28, which revealed additional intramuscular abscesses in the vastus lateralis muscle, which was also drained, with subsequent resolution of pain and normalization of inflammatory markers. This is the first case demonstrating pyomyositis as a complication of diverticulitis. While the mechanism of pyomyositis may not be unique, it is important to recognize the potential complications of frequently encountered diseases. In this critically ill and immunosuppressed patient, there was delayed diagnosis of both diverticulitis and pyomyositis, but the patient quickly improved once the diseases were recognized and treated.